Around noon today, I was sitting at my desk by back window of my house when I saw a female sharp-shinned hawk land on a very exposed branch about halfway up the seventy foot tall black locust tree that stands on the back edge of my yard. I thought it unusual that the hawk would pick a perch like this. Sharp-shins are ambush predators that like to burst out of cover to grab a passing, un-suspecting, small bird. They especially seem to like mourning doves but readily take cardinals, too. The female started calling in its high pitched, quintessential hawk scream. Mostly patterns of four: screee…screee….screeee…..screee. Then she paused and was silent for a minute or two, and then called out another pattern of four. After a few minutes a male sharp-shin (genders are easy to determine in sharp-shinned hawks. The females are about 50% larger than the males!) swooped in from the east and immediately mounted her. They copulated for 30 or 40 seconds, and then the male perched next to the female for several minutes. As I indicated in my previous posting, the Cornell Ornithology Lab website indicates that sharp-shins should be expected to be mating around here in late April or May after their arrival from their spring migration. These two sharp-shins, though, did not migrate possibly because of the abundant prey populations around our bird feeders. That they are mating 2 ½ months ahead of expectations supports the idea that they might be able to accomplish two reproductive clutches this season. A big, selective payoff for saving all that energy by not migrating! Soon, the female flew off toward the east and disappeared back behind the dense stand of hemlocks and arbor vitae that makes the east boundary of my property. 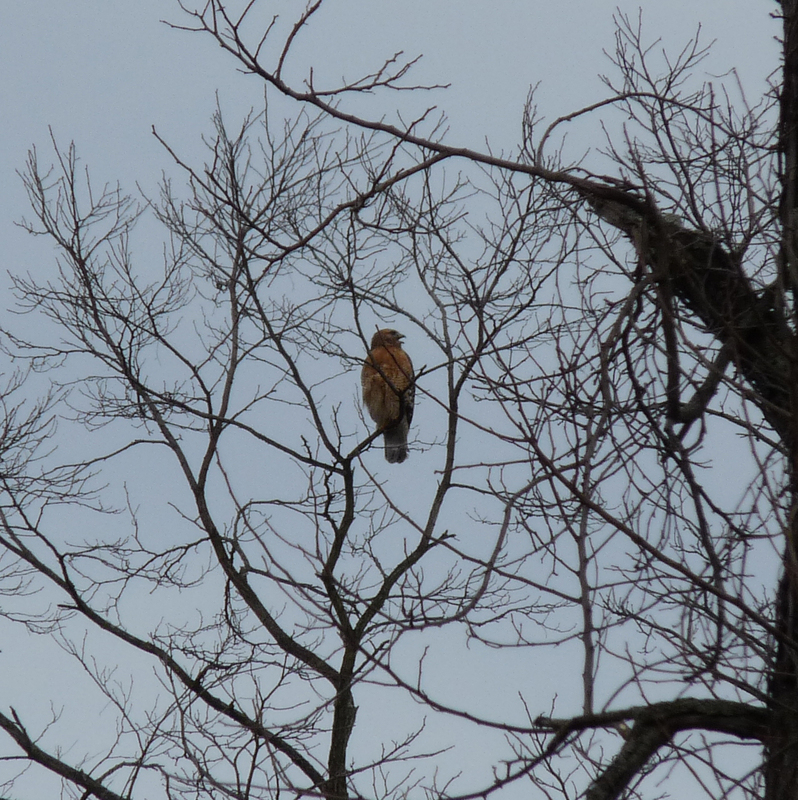 She returned, though, 30 minutes later and perched near the top of another black locust a bit further down the field. She started calling again, and then I saw the male also perched, lower down, in the same tree. After a few minutes, the male flew off to the west, and I could see that he had something (a captured bird?) in his talons. The female remained in place for ten more minutes periodically calling. Three crows joined her in the tree and I could see by their head movements that they were cawing and fussing at her. After a few more minutes, the female flew off also to the west and disappeared behind the a stand of spruces. The Hammond family just read your post and watched the video. Now, the Hammond girls are chock full of questions. How do they catch and kill the birds that they eat? Our local neighborhood hawk circles and screeches. Why do they exhibit this behavior? When I read the post, I substituted the word “playing” for “mating.” Hopefully, we can hold off on those questions until another day. Meanwhile, thanks for the post and video; we’re all hoping that spring is indeed just around the corner.